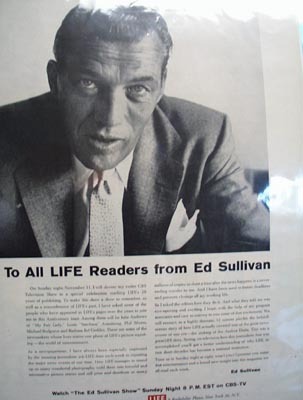 Ed Sullivan Salute to Life Magazine 1956 This is a November 12, 1956 advertisement. It is a nice black and white picture of Ed Sullivan. It reads, On Sunday night November 11 I will devote my entire CBS TV show to a special celebration marking Life's 20 years of publishing. In excellent condition. Photo is taken through plastic and may show wrinkles or crookedness that is not in the ad. This magazine tear sheet measures 10 1/2"" wide by 14"" tall. Items Similar To "Ed Sullivan Salute to Life Magazine 1956"